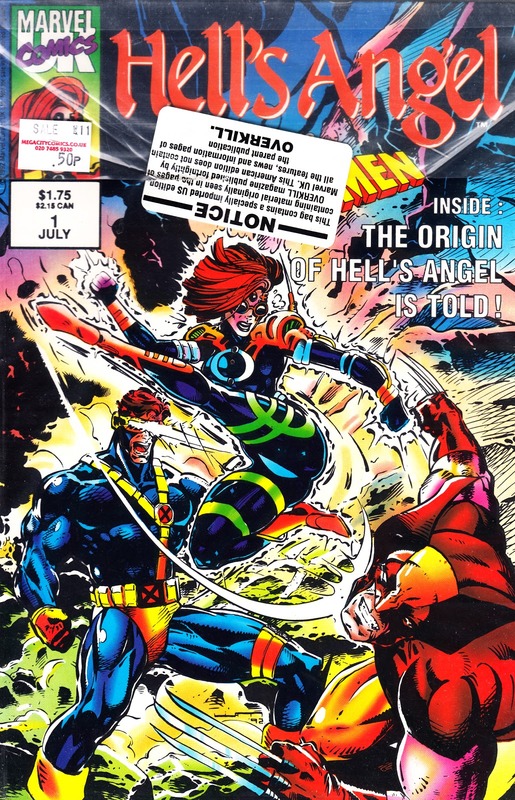 I stumbled across this slice of Marvel UK history whilst - ahem - browsing the bargain bins of a London comic shop earlier this week: an unopened edition of HELL'S ANGEL (latterly Dark Angel after a threatened law suit from a certain copyright-savy biker collective) with the OVERKILL STICKER still (just about) intact. 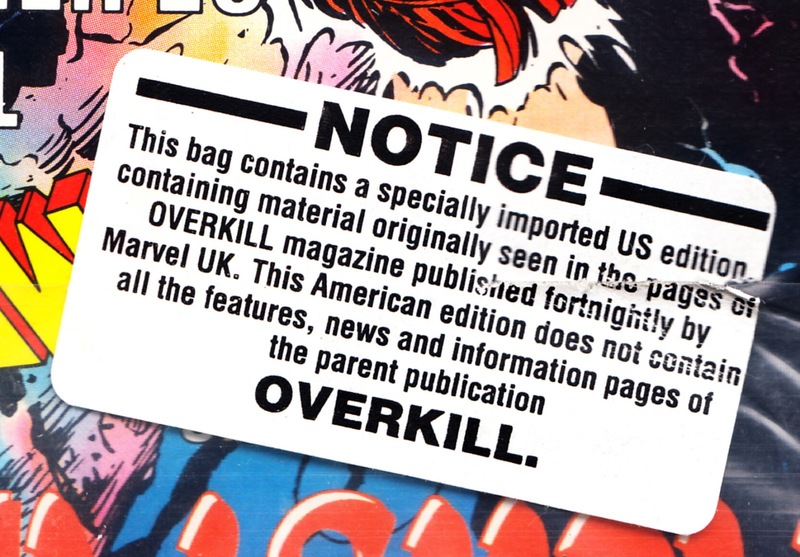 When Marvel UK launched their range of US comics, they were initially concerned that sales in their home market would cannibalise sales from OVERKILL, the newsagent-sold fortnightly which serialised (almost) the same material. Initially, there was talk of copies of the US editions (Digitek, The Knights of Pendragon, Warheads and Motormouth) would be embargoed and imports (officially) banned for UK comic book stores. That plan was quickly abandoned in favour of sealing copies in comic bags (the type used by collectors and retailers rather than mechanically-sealed polybags used by WIZARD and other comics and magazines) with this sticker used as the seal (in this case, applied upside down). Issues were also held back so that the strips made their first appearance in Overkill, meaning British collectors got their copies around a month after they appeared in the states. 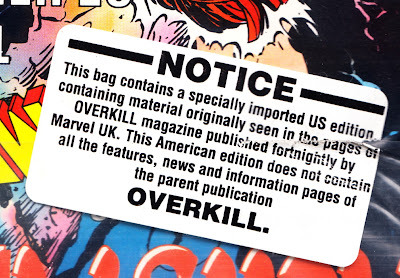 The information is slightly disingenuous, it's true that the US monthlies didn't contain all the supplementary material that Overkill did, but they did contain a lot of strip material (featuring US Marvel characters) omitted from the UK fortnightly. As the range expanded, the bag'n'sticker policy was abandoned and copies shipped to British retailers at the same time as their trans-Atlantic neighbours. As the boom turned to bust, M-UK was probably grateful for every UK sale as well! The policy of omitting pages from Overkill was also abandoned, probably to the relief of creators who had to structure issues to allow pages to be dropped.